* 2015 KBB.com 15 Best Family Cars Call Egolf Brevard at 828-884-4151. You make the drive, well make the deal and youll feel like family! With its stylish cabin and respectable fuel economy ratings, the 2015 Nissan Pathfinder is a solid choice for a seven-passenger crossover SUV. But you might find some competitors more appealing overall. A blind-spot warning system and rear cross-traffic alert have been added to the SL and Platinum trims, and AWD models are outfitted with hill-descent control. Also, the continuously variable transmission receives new programming that simulates conventional shifts, the 360-degree parking camera is now available on the SL, and standard equipment has been slightly reshuffled. Premium interior design with high-quality materials; easy third-row access; good fuel economy; user-friendly electronics interface. If you're looking to transport up to seven passengers in reasonable comfort, the three-row 2015 Nissan Pathfinder just might be the right vehicle for you. While the Pathfinder used to be a true SUV that rode on a truck platform, its most recent redesign ushered in a carlike crossover SUV design. It rides smoothly in most forms, and its revised continuously variable transmission (CVT) now performs simulated shifts that mimic a regular automatic. Shoppers who need extra space but aren't quite ready for a minivan may see the Pathfinder as an intriguing compromise. The interior is otherwise quite nice, though, with good materials quality and enticing features. We just wish you didn't have to pay extra for Bluetooth -- it's absent altogether from the S trim and provided only for phone calls on the SV, with audio streaming reserved for the SL (optional) and Platinum (standard). Cargo space is another shortcoming, as the Pathfinder is among the least capacious crossovers in this class. There are a number of Pathfinder alternatives these days that may be a bit more appealing. The 2015 Toyota Highlander is a well-rounded choice with a superior V6 powertrain. If you want something sportier to drive, you'll find it in the 2015 Mazda CX-9. The 2015 Dodge Durango can't match the Nissan's fuel economy, but it's got muscular styling, features galore and available V8 power. You may also want to consider the refined and roomy 2015 Chevrolet Traverse and the funky, wagon-like 2015 Ford Flex. Nonetheless, if the Edmunds.com "B" rated Pathfinder's still calling your name, it should provide fine three-row transportation with a minimum of fuss. The 2015 Nissan Pathfinder is a midsize seven-passenger crossover SUV offered in four trim levels: S, SV, SL and Platinum. Standard equipment on the entry-level S includes 18-inch alloy wheels, a roof rack, rear privacy glass, keyless entry and ignition, tri-zone automatic climate control, a manual height-adjustable driver seat (with manual lumbar adjustment), 60/40-split-folding second-row seats (with slide and recline), a reclining 50/50-split third-row seat, a tilt-and-telescoping steering wheel, cruise control and a six-speaker sound system with a six-CD changer. The SV model adds automatic headlights, a front tow hook, rear parking sensors, remote start, an eight-way power driver seat, a leather-wrapped steering wheel and shift knob, an auto-dimming rearview mirror, Bluetooth phone connectivity, a 7-inch color multi-information display, a rearview camera and an upgraded audio system with a single-CD player, satellite radio and a USB/iPod interface. Stepping up to the SL trim level gets you foglights, heated mirrors, a power liftgate (with position memory), leather upholstery (first and second rows), heated front and second-row seats, driver memory settings, a four-way power passenger seat, a blind-spot warning system and rear cross-traffic alert. Opting for the SL Tech package adds a larger 8-inch touchscreen display, a 360-degree parking camera, a 120-volt household-style power outlet, towing preparation (also available separately on SL and SV), a navigation system with voice controls and a 13-speaker Bose audio system with Bluetooth audio connectivity. The SL Premium package is essentially the SL Tech package plus a dual-pane panoramic sunroof. The top-of-the-line Platinum model starts with the above features and further adds 20-inch alloy wheels, a power-adjustable heated steering wheel and ventilated front seats. Offered exclusively on the Platinum is a Family Entertainment package that adds a rear-seat DVD entertainment system with dual displays. Depending on when your Pathfinder was built, standard equipment may vary slightly. Early Pathfinders (built before January 2015) in the base S trim do not include the standard roof rack; instead it is standard on the SV. Early SV models (pre-January 2015) also get foglights, heated exterior mirrors and painted roof rails. For Pathfinders built after January of 2015, those items are optional on the SV and standard on the SL. Finally, SVs built after January of 2015 get remote start as standard, which was previously standard on the SL. Every 2015 Nissan Pathfinder is powered by a 3.5-liter V6 that puts out 260 horsepower and 240 pound-feet of torque. It uses a CVT and can be paired with front-wheel drive or all-wheel drive (which Nissan calls four-wheel drive). The AWD system includes hill-descent control and a switch that allows the driver to lock power distribution in a 50/50 front-to-rear ratio, which is useful on dirt roads and in the snow. In prior Edmunds performance testing, an AWD Pathfinder went from zero to 60 mph in 8.0 seconds, which is average for the segment. The EPA fuel economy estimates stand at 23 mpg combined (20 city/27 highway) with front-wheel drive and 22 mpg combined (19 city/26 highway) with all-wheel drive. In Platinum trim, the Pathfinder is rated at 21 mpg combined (19 city/26 highway). Properly equipped, any Pathfinder can tow up to 5,000 pounds. 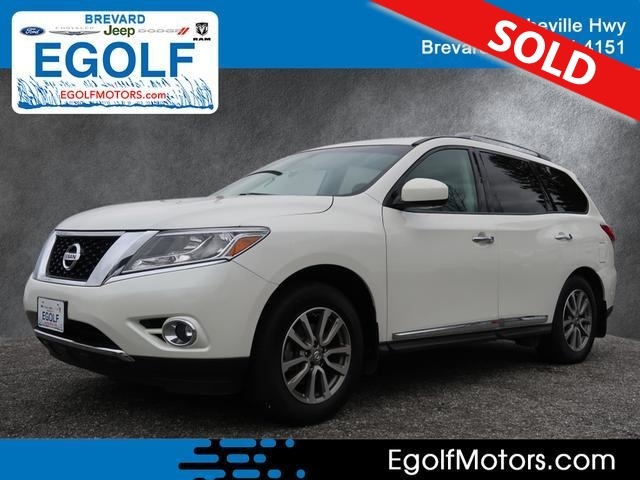 Standard safety features on the 2015 Nissan Pathfinder include antilock disc brakes, stability and traction control, front-seat side airbags and full-length side curtain airbags that cover all three rows of seats. Rear parking sensors and a rearview camera are standard on all Pathfinders except the base S, which can't get these items even as an option. The SL and Platinum come with a blind-spot warning system and rear cross-traffic alert, while the Platinum comes with a more deluxe surround-view camera system that is optional on the SL. In Edmunds brake testing, the Nissan Pathfinder AWD came to a stop from 60 mph in 124 feet, an average result for this segment. In government crash tests, the Pathfinder received the top five-star rating overall, with four stars for total frontal-impact protection and five stars for total side-impact protection. The Insurance Institute for Highway Safety awarded the Pathfinder the highest score of "Good" in the small-overlap frontal-offset, moderate-overlap frontal-offset, side-impact and roof-strength crash tests. The Pathfinder also received a "Good" rating for whiplash protection in rear impacts. A big part of the 2015 Nissan Pathfinder's appeal is its attractive cabin. High-quality materials give it a decidedly premium look, especially in the top Platinum trim level. The gauges and controls are easy to find and operate. We're especially fond of the touchscreen electronics interface -- there's nothing particularly flashy about it, but it's very user-friendly and offers helpful redundant controls adjacent to the screen. Both front- and second-row occupants will find their seats comfortable and supportive. The second-row seats can slide fore and aft and recline for greater comfort, and they'll slide forward even with a child's car seat in place, eliminating the need to uninstall the car seat in order to get people into the third row. When unoccupied, those seats also slide farther forward than those of most competitors. Unfortunately, once back there, third-row leg- and headroom trails that of competitors like the Chevrolet Traverse, Ford Explorer and Honda Pilot. Only children or small adults are likely to be comfortable. The 2015 Pathfinder also has just 16 cubic feet of cargo room behind the third row, but with the second- and third-row seats folded flat, it offers a useful but comparatively modest 79.6 cubic feet. Most competitors offer more maximum space. As a suburban runabout, the 2015 Nissan Pathfinder gets the job done. The 3.5-liter V6 and CVT are responsive enough in most situations, and the gearless CVT's simulated upshifts take some of the monotonous droning out of maximum acceleration. It's still an unconventional experience, however, so we recommend a thorough test-drive to make sure you've got a feel for how the transmission operates. On pavement, the Pathfinder's suspension does a good job soaking up bumps and road irregularities to create a smooth, stable ride. However, if you choose a Platinum model, which has 20-inch wheels, the ride is noticeably stiffer. Although the steering is light and precise, handling is not a strong suit for the Pathfinder, and it feels large from behind the wheel. Consumers looking for sportier handling will find it in the Mazda CX-9, for example, although we suspect most Pathfinder buyers won't view this as a significant weakness.